With Johnny Saldaña as a new third author to the ghosts of Matt Miles and Michael Huberman, a new edition of this classic text on qualitative data analysis is back. 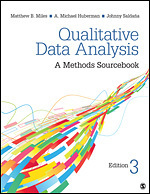 This 3rd edition stays true to Miles’ & Huberman’s original organization and ideas, but is significantly updated with the inclusion of more information on computer based analysis and specific approaches to qualitative research emerging over the past few decades. The new edition ends with a very good list of resources for qualitative researchers. Wikipedia has a short entry with links to most computer assisted qualitative data analysis software, including freeware, proprietary, and web-based programs. For multiparty talk such as that in focus group interviews, I find it best to use both a DVD recorder for picture and a high quality digital audio recorder. The video, though optional, can help with gesture/gaze/proxemics and so on, while the audio recorder provides the primary data source for transcription. Any DVD recorder can provide picture; for audio, I’ve found it’s better to spend a bit more for good quality. I have been super happy with my Roland Edirol R-09HR, though I don’t think they’re still making them. Something like the Zoom H4n looks like it would be a good replacement. You upload your audio files from SD card to your PC/Mac, save the master, and work with a duplicate file for transcription. I’ve used several transcription applications… For audio, I use Audacity for microanalysis (freeware). For less fine-grained audio transcription, Express Scribe is great (freeware). I use a footpedal with Express Scribe, along the lines of this one: . Other options for audio transcription apps: Adobe Audition: (pricey!! ); F4 audiotranscription: (freeware); Sound Writer and Voice Walker (freeware; but old apps); Transcriber AG: (freeware). There’s also Dragon Naturally Speaking, which is a talk-to-text application, but it’s not great for interview transcription (you have to listen to your audio file, repeat what it said on it, which DNS then transcribes… and with the latest versions of DNS (11 and 12), there are some unresolved problems with Word integration). If you wind up wanting to do video transcription, then Transana is in my experience the best out there ($50). While I’m not sure exactly how this translates to research or evaluation, this display of the spread of an ‘idea’ (more accurately a Facebook post of Marvin the Martian) is interesting and compelling. Having recently struggled with meaningful ways to present social network data to project staff this makes me wonder if there are similar animated ways to illustrate the nature and evolution of SNA maps. While simply counting words and phrases doesn’t provide a deep analysis of text, it can be a start in identifying basic themes or ideas for further analysis. This example from the NY Times is a simple count of frequently used words and phrases during the Republican party’s convention. 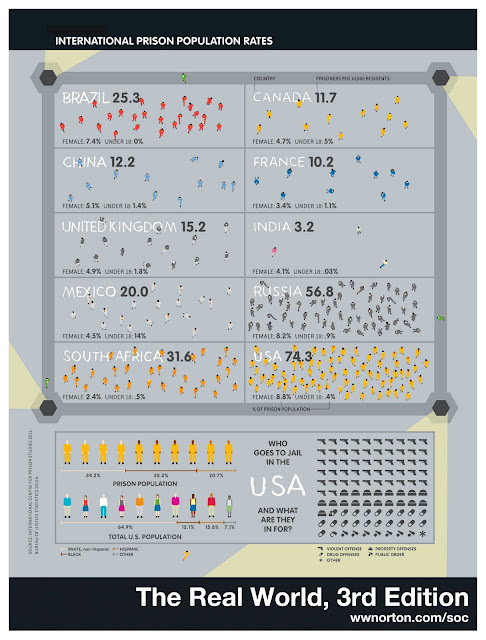 The intermediate analysis value lies in part in the graphic illustration of the word count and the quick reference to examples of full text where those words/phrases appear. 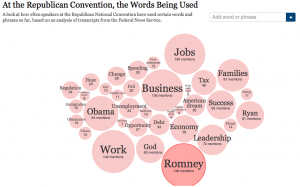 The graphic quickly orients the viewer to the fact that the candidates are most frequently mentioned (as is the anti-candidate Obama) ~ not to surprising, but also to those ideas that are most present in the speeches, for example, work, business and jobs are the main theme followed by leadership, families and god. Clicking on any word or phrase then highlights it in context in excerpts from variou speeches. Here is an interesting article, MIP: A Method for Identifying Metaphorically Used Words in Discourse, that illustrates how to look very carefully at the potential metaphoric meaning in text. Research design is really just a plan of action. Because the search for meaning, understanding or critique are open-ended, it does not mean that interpretive and critical research cannot be designed. If you want to familiarize yourself with HyperResearch check out the series of webinars on the Researchware website. In four parts, the presentation is clear and gives a very good overview of the basics of the software. Just published issue of Forum: Qualitative Social Research focusing on qualitative data analysis software from multiple perspectives.